Tightness testing is carried out on existing or new gas pipeline installations to ensure that the industrial and commercial gas pipeline is safe for use, or continued use, and will not be rendered a hazard or cause an unsafe situation. It is important to note that even if the tightness test is satisfactory (the volume complies with industry standards), a smell of gas or presence of gas detected would fail the test, and necessitate the trace and repair of the apparent fault.  To ensure your industrial and/or commercial gas installation pipeline is monitored and maintained, and in compliance with the conditions set out in The Gas Safety (Installation & Use) Regulations 1998, we advise that all pipeline installation and associated pipe work be tested and inspected on an annual basis. This can normally be carried out at the same time as your annual gas appliance service visit or as part of a gas safety check.